Today’s subject of The Voices of Fallout 4 is with a wonderful actress who is probably pretty well renowned to people much younger than I. Chelsea Tavares starred in the popular Nickelodeon shows Unfabulous and Just Jordan, that I was unfortunately a bit too old to be drawn to during their run. But, I’m certain she was fabulous. 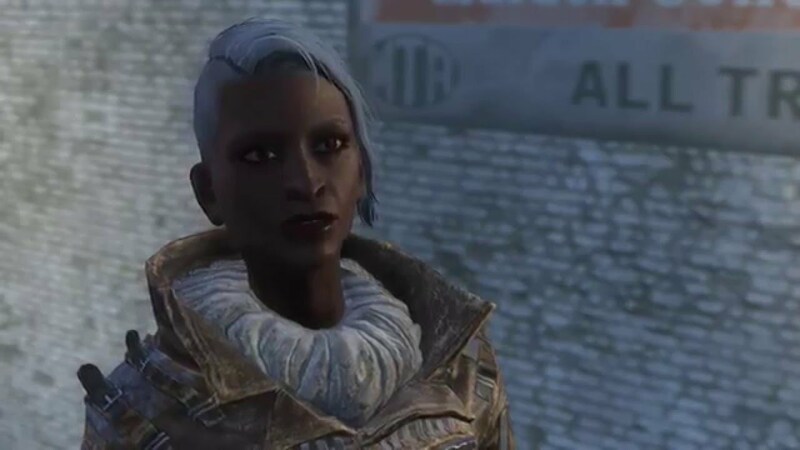 I am even more certain though, that she has done an amazing job as a voice over artist in our beloved Fallout 4 series when she voiced everyone’s favorite Railroad martyr, Glory. One of my favorite characters in the series. Glory was the type of character that I was always desperately hoping to see more of. In fact, it is the only real downside of Fallout 4 for me that this amazing character wasn’t in the game enough! I was really hoping she had the possibility of reaching companion status, but unfortunately it wasn’t quite in the books, as we all know her fate in whatever direction you might have decided to take the story line. But in looking back, she was quite the badass, and an all around great character for the short time we had her. And part of the credit for Glory’s appeal has to go to the amazing young woman who voiced her. Chelsea Tavares has already had a very impressive career thus far, but there are no signs of stopping in her current progression. She is surely due to be a household name. She appeared (briefly) in the remake of of our old friend Tom Holland’s film, 2011’s Fright Night. If you find yourself with the chance to check out her work that didn’t quite make the final film, you will know that she was fantastic! There is just no stopping this wonderful force of life who was kind enough to lend her vocals to the Wasteland’s biggest badass, and was also kind enough to share a few words with us here today. So please enjoy a few words from the great Chelsea Tavares! When did you decide you wanted to make acting your occupation? And what were some of your earliest influences? My mom took me into the industry when I was young and I started print work first. Then I started commercials, I just always loved the stage and expressing my emotions. I am NOT shy, at all. I’m also a singer and one of my earliest influences was my mom. She used to sing around the house and I knew I loved both acting and singing. What was life like for you as a working teen actress on shows like Unfabulous and Just Jordan? What was set life like for you at that age? When I first booked UnFabulous I was in 7th grade so at that age being on any Nickelodeon or Disney show is a dream. It’s really nice when you’re that age because you aren’t thinking about the money you’re thinking about your craft. You appeared in the great 2011 remake of our old friend Tom Holland’s film Fright Night (which also featured our old friend Lisa Loeb), and were phenomenal. How did you enjoy working on this project? Were you a fan of the original film? The fact that I got to work with DreamWorks was a humbling experience, because it taught me a lot about the movie making industry. I actually got a lot of my scenes cut out so it’s funny how you say I was phenomenal when I wasn’t really in it ahahahaha. It’s okay though, that’s why you have to have the mentality to be ready for whatever happens and persevere until you reach your goal. The cast was amazing and everyone was super nice while we filmed in New Mexico. I love any movies about vampires, so both films were awesome! RIP Anton Yelchin. I send my blessings to his family, it was great working with him. How did you find yourself in the Fallout 4 world? What drew you to do the voice over work for the legendary Railroad agency we all knew and loved, and hated to see die, the great Glory? I’ve been doing voiceover work since I was young. I voiced a few characters on video games, including my first one ever, which was The Lion King videogame in the 90’s. I was about 8 or 9. Playing Glory was really dope, what drew me to her was that she was a natural badass and I love playing the aggressive, no back down type of female. How do you enjoy the work as a voice over artist? Would you say it is easier or more difficult to do compared to on screen work? Being in the voiceover world is much easier. You don’t have to be TV ready, so I can basically go in my pajamas and record in the booth. It also takes less time, which is amazing, but you do have to take care of your voice. It’s sometimes challenging trying to convince the audience that the character they see on on screen, would really have that voice. So what do you have coming up? Anything you can tell us about coming in the near future? Yes, I do actually! This past summer I shot a series called Tycoon, which will be released on this new streaming platform called Black Pills. It’s essentially like Netflix and Hulu, but with it’s own variety of shows. I also shot a movie in Chicago called Death: Take 2. I got to work with the wonderful Grant Rosenmeyer and Jon Lovitz.